Be the first to share your favorite memory, photo or story of Oneta. This memorial page is dedicated for family, friends and future generations to celebrate the life of their loved one. 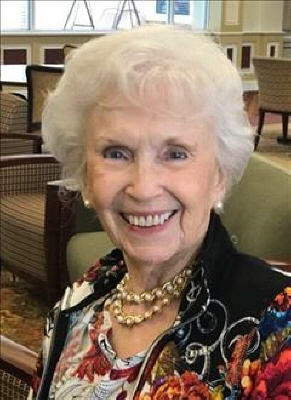 Oneta Nadine (Moore) Whitlock, age 97, passed away peacefully on March 17, 2019, in Lubbock, Texas. Oneta was born on Valentine's Day, February 14, 1922, in Glencoe, OK, to William Bary Moore and Flora (Harp) Moore. She was the youngest of six sisters and three brothers. She grew up on the family farm outside Glencoe, OK, during the great depression. She graduated from Glencoe High School in 1939. In 1941, she was visiting her sister, Dee, in Fletcher, OK, and met L. D. Whitlock. It was love at first sight. Oneta was 4'11" and wore a size two dress. Because of her size, she became known as "Chigger", a name that stuck with her in Fletcher for the rest of her life. L. D. and Oneta were married two years later on June 20, 1943, in Pawnee, OK. They were married for 73 years before L.D. 's death in 2016. Oneta and L.D. faced many hardships early in their marriage. First there was the great depression. Then they were separated for periods of time while L.D. served in WWII, attended dental school, and then served his country during the Korean War. During L.D. 's absence, Oneta was raising their two young sons, Lowell and Mark. In 1953, L.D. established his dental practice in Altus, OK, and during those early years, Oneta would, at times, assist him in the dental office. Two more sons, Dougie and David, were born in Altus. Oneta became active in her sons' activities. She was president of the Washington Elementary PTA. She and L.D. were AHS Class Parents when the boys were in high school. Life was good...until May, 1961, when their third son, Dougie, was killed in an automobile accident at the age of seven. The accident was devastating for the entire family. But Oneta and L.D. 's love for each other became stronger and their faith in God also became stronger. Oneta turned to writing and later published her first book, Treasured Moments. In 1975, she was honored as Pen Woman of the Year by the Pen Women Organization. Oneta then returned to college to get her degree from Oklahoma City University. She graduated in 1981, at the ripe age of 59. She was named Beta Sigma Phi's First Lady of the Year in 1982. She was the Director of Public Relations at Jackson County Memorial Hospital for two years, before leaving that position in 1983. Oneta then taught creative writing classes at Western Oklahoma State College for several years. During this time, she also published her second book, Tender Moments, in 1991. Oneta was always a big support to L.D. throughout his career. She presided and served on several dental boards and foundations with the Oklahoma Dental Association. They embarked on several dental mission trips together to help those in need. Oneta was Dr. Whitlock's dental assistant during these mission trips. These trips included: Africa, Yemen, India, Dominican Republic, Trinidad, Barbados, and Haiti. Oneta's love for the Lord was evident throughout her life. She was active in the First Baptist Church and served as Youth Director, Director of Acteens and Sunbeams, and taught several Sunday School Classes. But she took the most pride in an International Class that she started for ladies whose husbands were stationed at Altus Air Force Base. Many ladies from several different countries came to know the Lord through this class. Meme, as her grandchildren called her, had a great love for her family. She cherished her time with her children, grandchildren, and great grandchildren. Meme made any family holiday, birthday, or any occasion at their home or at "The Cabin", memorable and special. Oneta loved Altus and would always refer to Altus as her home. She gave back to the community and served on several boards and was involved in many clubs and charities. Oneta was preceded in death by her loving husband of 73 years, L.D. ; a son Dougie; her parents, William Barry Moore and Flora (Harp) Moore; six sisters and three brothers, and a grandson, Harrison. She is survived by three sons: Lowell Whitlock and wife Rebecca, Wichita, KS; Mark Whitlock and wife Joy, Altus, OK; David Whitlock and wife Lori, Lebanon KY; Eight grandchildren: Wende Wayne and husband Peter, Houston, TX; Tangie McMall and husband Chris, Altus, OK; Stacy Miller and husband Roddrick, Atlanta, GA; Brian Whitlock and wife Mandy, Lubbock, TX; Melanie MacKenzie and husband Morgan, Lubbock, TX; Mary Whitlock, New York City, NY; David Whitlock Jr. and wife Kayla, Middlesboro, KY; Madi Walls and husband John, Lebanon, KY. Also surviving are 15 great grandchildren; and several nieces and nephews, and many friends. Funeral services will be at 10:00 am on Thursday, March 21, 2019 at Lowell-Tims Funeral Chapel in Altus, Oklahoma. Funeral arrangements are under the direction of Lowell-Tims Funeral Home and Crematory, Altus, Oklahoma. Lowell-Tims will provide a live web-cast of the service beginning at 9:58 a.m. Thursday. Go to www.Lowell-Tims.com and click on Oneta Whitlock. There will be a blue tab that says "watch webcast" inviting you to join the web-cast. To send flowers or a remembrance gift to the family of Oneta Nadine (Moore) Whitlock, please visit our Tribute Store. "Email Address" would like to share the life celebration of Oneta Nadine (Moore) Whitlock. Click on the "link" to go to share a favorite memory or leave a condolence message for the family.